The hilly green island of Sámos (Turkish: Sisam) lies close to Turkey, from which it is separated by a strait only 1.9 kilometers wide. Fertile and densely wooded, it has only recently become a target for mass tourism - in the past it lived from farming, boatbuilding, and fishing. 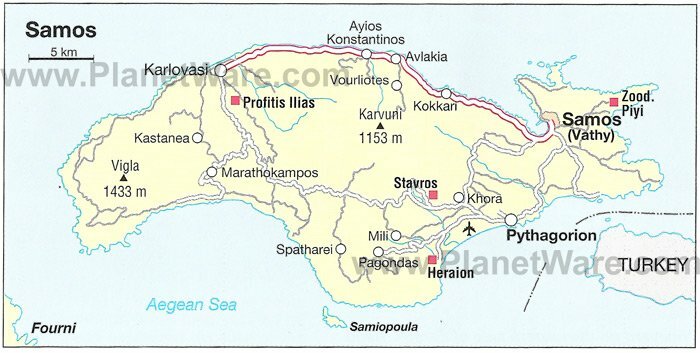 It is also the site of one of the most important sanctuaries of the ancient world, the Heraion (Temple of Hera) on the southeast coast, which is now a UNESCO World Heritage Site, along with the nearby ancient harbor town of Pythagorion, which is named after the world-renowned Greek mathematician and philosopher Pythagoras (570 BC-495 BC). 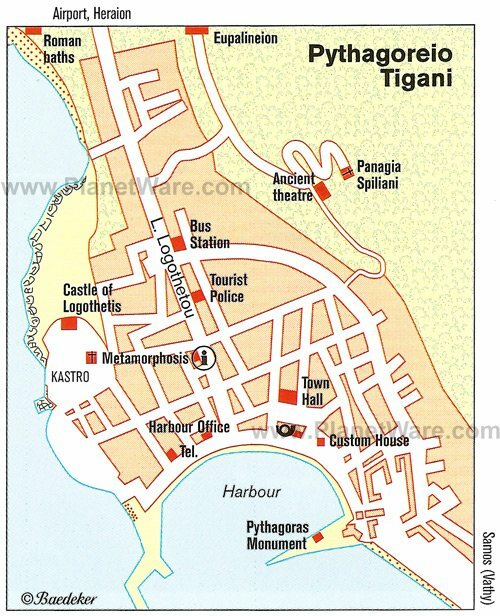 On the island's south coast, the friendly little town of Pythagórion was known as Tigáni until 1955, when it was renamed to honor Pythagoras, who was born here. Built around a sheltered bay, now filled with fishing boats and smart yachts and overlooked by cafés and seafood tavernas, it was once the ancient port of Sámos, a powerful maritime and mercantile state in the sixth century BC. The remains of the ancient fortified port, with the ruins of Greek and Roman monuments, can still be seen. A small archaeological museum displays Archaic and Hellenistic funerary stelae (grave stones), marble statues, coins, and ceramics uncovered in the area. On a hillside behind the town of Pythagórion stands the quaint white Monastery of Panagia Spiliani (Monastery of the Cave of the Virgin Mary) founded in 1586. From the entrance, 95 steps lead down into a large, cool, and peaceful cave, with a tiny church at the end, which is decorated with religious icons. From the monastery, you have amazing views down onto the town and across the sea towards the Turkish coast. Lying eight kilometers west of Pythagórion is the Heraion, the Temple of Hera, one of the island's top tourist attractions. A succession of temples was built on this site from the eighth century BC onwards, culminating with a colossal structure measuring some 45 meters by 80 meters, supported by at least 100 columns, which was begun around 570 BC. This was destroyed 30 years later in a Persian raid - a replacement was planned on an even larger scale, which would have been the largest Greek temple ever built, but it was never to be completed. The archaeological site around the Heraion includes altars and smaller temples, as well as the ruins of a fifth-century Christian basilica. Finds from the site are exhibited in the archaeological museum in Samos Town. 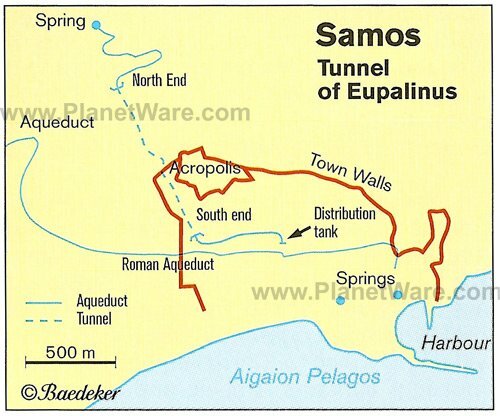 Once considered one of the Wonders of the World, this underground aqueduct lies two kilometers west of Pythagórion. Constructed by Eupalinos in the sixth century BC, it is one kilometer long and approximately 1.75 meters high and wide. Excavation started from both ends and met successfully in the middle - and this was before the advent of surveying and mapping. About 425 meters from the entrance, you can see the point where the two shafts met, making an almost perfect joint. It's a very tight space, and is not recommended for those who suffer from claustrophobia. 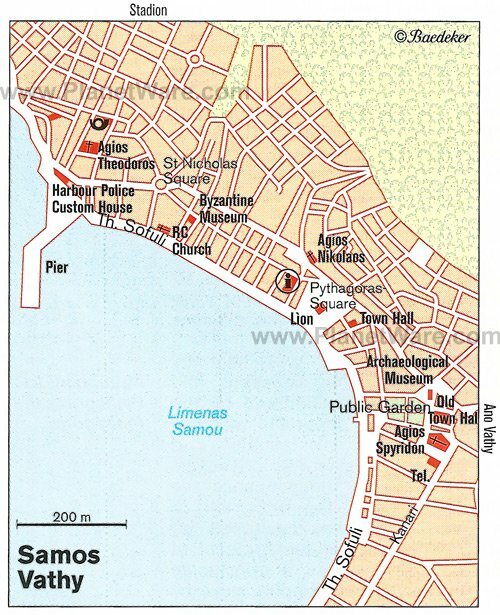 In a sheltered bay on the island's northeast coast, Sámos Town (also known as Vathy or Vathi) was founded in 1832 as the island's purpose-built capital. Elegant Neoclassical houses rim the horse-shoe shaped harbor, many of which now accommodate waterside cafés and restaurants at ground level, while modern concrete apartments sprawl along the coast and up the hillside overlooking the sea. From here, regular ferries run to and from Athens' port of Piraeus. Housed in the former residence of the Prince of Sámos and a newer building opposite, this museum displays finds from the Heraion (Temple of Hera). The main hall was specially enlarged to accommodate the most sensational find, the colossal sixth-century BC marble figure, 4.8 meters high, of an Archaic kouros (athletic young man), possibly a votive statue from the Sacred Way. The torso was found in 1980 and the head (70 centimeters high) in 1984; the knee had been found 70 years earlier, in 1912. Other exhibits include Hellenistic and Roman sculpture, and prehistoric material such as pottery, ivories, and bronzes. On the northwest coast, west of the port of Karlovassi, this small secluded pebble cove is one of the most stunning beaches on the island. The only way to reach it is by boat or on foot, which is part of the fun. It takes about 30 minutes on foot, passing through olive groves and pine woods, and once you arrive, you'll find a lovely bay with amazing rock formations and crystal clear sea. Wear comfortable hiking shoes and take plenty of water and something to eat - there are no facilities on the beach. Beyond Mikro Seitani lies Megalo Seitani, a large sand beach, which is also nice but not as pretty. Proteas Blu Resort: luxury seafront resort, private beach, beautiful pool, sea-toned decor, deluxe spa. Fito Aqua Bleu Resort: mid-range beach resort, serene room decor, opposite a pebble beach, inviting outdoor pool. Armonia Bay Hotel: affordable rates, near the beach, friendly hospitality, marble floors, infinity pool. Anthis Studios: budget apartments, walk to the beach, family run, kitchenettes, outdoor pool.